Description: Innovative inverted folding design: opens and closes ````````inside-out```````` making it easier to use when entering and exiting a vehicle and keeping the water contained and outer surfaces dry. 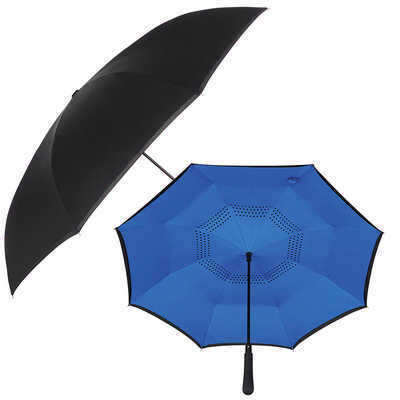 Features: The umbrella can stand on its own when closed allowing the water to drain out to dry. Auto closing with push button pinch-proof runner. Dual layer pongee canopy. Packaging: Colour: Black Material: Product Size: 750mm - Folded Freight details : 24 per carton, 14.5kgs, 81 x 37 x 20.5cms; Decoration Type(s): Colour Print / Full Colour Print Decoration Area: Print - 120mm(h) x 200mm(w). Price includes : Item incl 1 panel with a 1 colour print. Setup is included.